I seem to have had a Monica Dickens mini-readathon. From One Pair of Feet, I progressed to her autobiography, An Open Book, written when she was in her sixties. She describes the background, inspiration and research she undertook for many of her novels. It was intriguing to read that One Pair of Feet made her a pariah in the nursing profession! She was unable to get another nursing job for a long time, and when she did, the other junior nurses were warned not to mix with her, because she had brought their noble calling into disrepute. Once she learned that after she'd taken a particular practical exam, the examiners were discussing her book, and all agreed that she must have been a rotten nurse. Monica's superior said she felt like telling them, you've just passed her for her Grade III (or whatever it was) and praised her poultices… (or whatever it was!) It was also interesting to discover how much insecurity and self-doubt lay beneath her breezy accounts of working in service, and in nursing. She was nothing like as confident as she makes herself sound -- a reminder that even memoirs are often partly fiction. After An Open Book, I went back to the compendium and read Kate and Emma, which she wrote after accompanying some social workers on their rounds and seeing the poverty and deprivation and abuse they had to deal with, and the way that cruelty to children can repeat down the generations. Sadly, though this book was set in the sixties, I'm sure that not much has changed (more paperwork for the social workers, probably). Kate and Emma charts the friendship between a magistrate's daughter and a teenager fostered away from her neglectful and abusive parents, and, realistically, it doesn't end well. 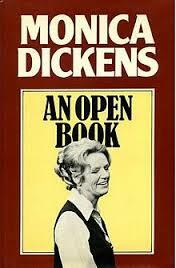 Monica Dickens founded the first branch of the Samaritans in the United States, where she moved after her marriage. This was a helpline for the desperate and lonely, which provided just a listening ear, someone to talk to, for people in crisis. I'm not sure if they are active in Australia. There seems to be a branch in WA, but perhaps elsewhere Lifeline fills this niche. I once applied to volunteer for Lifeline, but had to pull out because I was planning to travel overseas and couldn't give the required commitment. Maybe I should look into it again. Listening seems like something I could do. 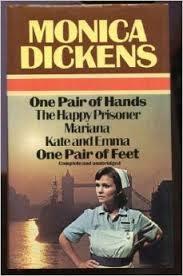 I started at the back first, with Dickens' nursing memoir, One Pair of Feet, first published in 1946. In the last twelve months I have had more experience with the health system than ever in my life before, last year as a patient and this year as a relative. So I was very interested to read an account from the other side of the screen, so to speak, and Monica Dickens is always amusing. She has a gift for sketching vivid characters very economically (and ruthlessly), and the background of this book, wartime Britain, is filled with telling details. The nurses scramble in and out of the bathroom window when they want to pop out for an illicit night off with the local airmen, and there are brief flurries of excitement when her hospital plays host to some evacuated casualties… Expecting victims of bombing raids, they are surely disappointed when the real evacuees arrive -- dull old men from a nursing home, bumped out to make way for the 'real' casualties. And two shot-down German airmen make a brief appearance on the ward and inspire excesses of patriotic disgust, apart from the one nurse who actually falls in love with one of them. 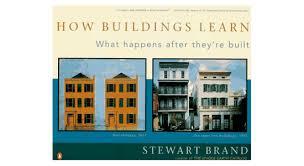 Wow, I really enjoyed Stewart Brand's How Buildings Learn: What happens after they're built! He realises that we need to think deeply about our buildings before we build -- not to predict every eventuality and try to produce the perfect solution for eternity, but to leave room for flexibility and ease of adaptability -- because our relationship with the buildings we live and work in will inevitably change. I have a personal stake in this discussion. Our house was first built in 1927 and its core has endured, with various paint jobs, ever since. In the 1990s, Stephen and Colin, who owned the house before we did, updated the kitchen and bathroom, built a back porch and a separate artist's studio in the backyard, filled the garden with native trees, and added their own leadlight and mosaics touches. Five years ago, we added a big living/dining room at the back of the house, bringing the outdoor laundry inside the house, and converted the previous living room into a library, which also gained a window. Later, we lined the roof space to create a light and useful attic storage room. Now we're planning another extension, to add a second bathroom in the space between the house and the studio, incorporate the studio into a granny flat and add a small extra bedroom. I think because we lived in the house for years before we renovated, we resisted eating up big chunks of the garden, like so many of our neighbours have done. It feels as if the house has grown organically, creeping out of its original footprint but preserving its essential soul intact. In fact, by including a huge window and a window-seat nook in the back room, the garden feels more like part of the house than ever. This still doesn't feel like a big house; we don't have the cavernous single space, (dining/kitchen/family room) that most of our neighbours have added, but we have plenty of room to move and spread, and lots of connected nooks where people can work and read and type and listen to their own devices, but still be within speaking distance of each other. 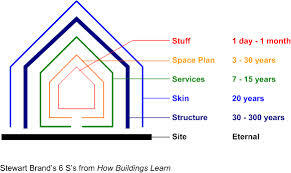 All the time I was reading How Buildings Learn, I was thinking, this would make a fantastic TV series. Well, it seems the BBC had the same idea. I think you can find it on YouTube. Over the years, my various book groups and the members thereof have introduced me to many wonderful titles that I might not have come across otherwise. Unfortunately, the flip side of this phenomenon is the unpleasant duty of occasionally being forced to read books that you don't enjoy at all. It's not often that two out of the three books assigned for my convent book group prove uncongenial, but such was the case this month. I've already mentioned that I found The Adventures of Huckleberry Finn hard going, despite the odd amusing scene or pithy social comment. At least I did better than many of my fellow book groupers, who didn't manage to finish the whole book. On balance, I'm glad I read it, because it was such a ground-breaking text and so influential on American literature, and it was an interesting picture of a period of America history that I only know through books. But I won't be rushing back for a re-read, that's for sure. If the whole middle section with the con-men had been edited out, I would have enjoyed it much more. Hucksters are just boring to me, I'm afraid. 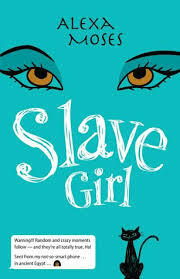 The other book we'd chosen for our Slavery theme was Alexa Moses' Slave Girl, which is apparently the first of a series in which the deeply shallow 13 year old Jenna will be whisked back in time to Ancient Egypt. I'm afraid I had no patience for this one. I made my 11 year old read the first chapter and she didn't like it either, though she admitted that it might appeal to some of her friends. I just couldn't overcome my dislike of the central character, who was so selfish and unimaginative that I couldn't summon up any sympathy for her plight at all. Perhaps she's an accurate portrait of modern youth… The publishers must hope so! But now I've slogged through them both, I'm free to read whatever I feel like! More positive reports coming your way soon, I hope.